As Glass Onyon promotions, Billy works with many of his idols from the ’60s–’80s. He began as a drummer, attended Berklee College of Music, and began Ant-Bee in the late ’80s, both as a Zappa-esque improv live act and as a tightly layered, Beach Boys–psychedelic solo recording effort. 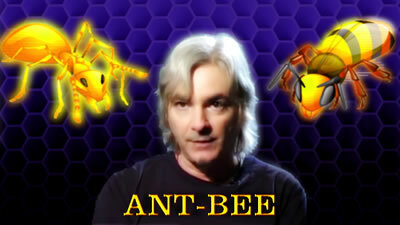 He’s released four albums as Ant-Bee, increasingly including as collaborators many of those same idols. We discuss two tracks from Electronic Church Muzik (2011): “Flutter-Bye, Butter-Flye” (built around an old recording by Michael Bruce from the Alice Cooper Group) and “The Language of the Body” (built around a spoken-word piece submitted by Gong’s Daevid Allen and layering on parts by Zappa alumni Bunk and Buzz Gardner on horns, and a whole electronic piece spliced in by Don Preston). We then look back to two tracks released on With My Favorite “Vegetables” & Other Bizarre Muzik (1994): We discuss the trippy “The Girl with the Stars in Her Hair” and listen to his Beach Boys cover “Do You Like Worms?” The opening/closing music is from “Eating Chocolate Cake (In the Bath)” from Pure Electric Honey (1990). For more information, see ant-bee.com and glassonyonpr.com. Billy did a whole drum solo on Steve Vai’s first solo album in 1984. Here he is in 1992 playing drums live with Bunk Gardner and Don Preston. You can hear him tell some of the stories he mentions on the podcast at more length on the several Outsight Radio Hour interviews he’s done. You can hear all of Billy’s albums on YouTube. Electronic Church Muzik also features pieces by Peter Banks (Yes), Jan Akkerman (Focus), Zoot Horn Rollo (Captain Beefheart), and more Zappa alumni. As a scholar of Zappa, Billy has appeared in several documentaries like this one. He’s written several books about or with many of these artists: Michael Bruce, Zoot Horn Rollo (aka Bill Harkleroad), Peter Banks, Don Preston, and also Todd Rundgren, Grand Funk Railroad, and Joey Molland (Badfinger).